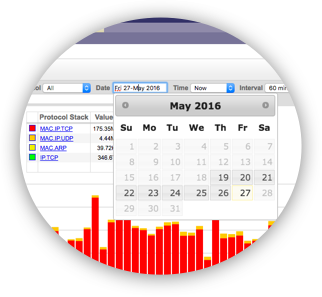 May 2016: InMon Traffic Sentinel 8.0 is now available for download. This is a free upgrade for customers who have purchased annual maintenance. The Home>Dashboard page can now be defined using a powerful extension to the REST API builder. See tutorial. Partial query results and de-duplication analytics are now held in a cache on disk. This results in a dramatic performance boost for queries that repeat or overlap. Such as in dashboards and periodic reports. Extend visibilty down to the container level by running the host-sflow agent on your servers. Even if transient containers are coming and going in large numbers Traffic Sentinel offers container, server and cluster-wide visibility into performance metrics and traffic patterns. The new lightweight macvlan adaptors can be monitored for traffic too. When you migrate servers into the cloud you have no access to the switches or virtual-switches they connect to. This can mean that you lose visibility into the traffic patterns. However the free host-sflow agent can now generate sFlow with near-zero overhead connecting only to the virtual adaptor that is still accessible to you. 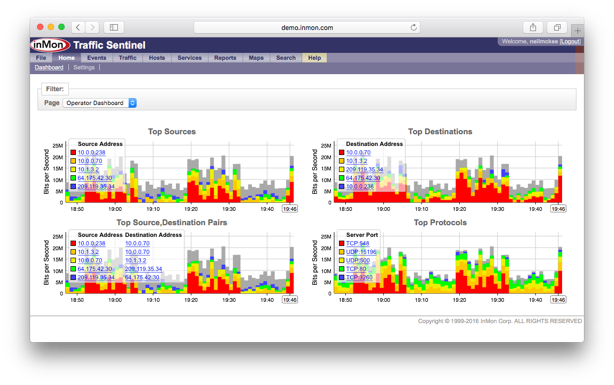 Traffic Sentinel has the scalability to accept this feed from thousands of servers. Traffic Sentinel 8 supports the new optical monitoring extension to the sFlow standard, and will also try to populate those metrics from vendor SNMP MIBs. Sinking values for ifcounters.mod_rx_power can forwarn you of emerging problems with a fiber-optic cable, and a sharp drop can indicate that the cable was bent or tapped. User-defined counters, gauges and string-values can be sent to Traffic Sentinel as rtmetric messages via any host-sflow agent as described here. The results are accessible to the scripting API under view="rtmetric". Installation on Debian or Ubuntu servers is supported via a separate download (.deb package). The File>Forwarding page now allows selective forwarding of sFlow or NetFlow/IPFIX feeds to other collectors, with greater flexibility than before. The EnableUDPForwarder and CCSFlowHost1 options in the global.prefs file are therefore no longer supported and will be ignored. The Signatures feature has been removed. If you were using this then please contact InMon support for suggestions on how to accomplish this in other ways, such as scripted multi-queries. The Quota Controller feature has been removed. If you were using this then please contact InMon support for suggestions on how to accomplish this in other ways, such as the REST API Builder. Use a text editor to add a line "java.exec=java" to /usr/local/inmsf/etc/config/global.prefs, then: sudo service inmsfd restart before proceeding with the upgrade to Sentinel 8, either manually or via the File>Upgrade page.